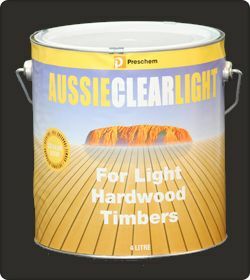 AUSSIE CLEAR is an exterior decking oil and timber finish that protects the hardwoods from the weather. It is the best oil based finish to highlight the natural grain and beauty. This results in a completely natural oiled look. AUSSIE CLEAR stabilises timber as it repels moisture, reducing checking or splitting. No film is allowed to form, so peeling or cracking is never a problem. It also inhibits unsightly mould growth with its powerful mouldicide. It has been specially formulated and tinted to use on a broad range of hardwoods. 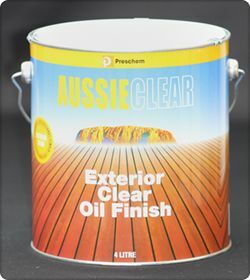 AUSSIE CLEAR can be used wherever a clear oil based exterior finish is required. This includes exterior decking, fencing, pergolas, weatherboards, window frames, furniture, cladding or facia. Timber finishes / decking oil such as AUSSIE CLEAR are suitable for all popular timber including Cedar, Merbau, Jarrah, Cypress Pine, Spotted Gum etc. It has been formulated with its own “transparent” pigment to appear clear on darker hardwood timbers. Use Preschem TREATED PINE CLEAR on Treated Pine based products. AUSSIE CLEAR is recommended for mid to dark toned hardwoods such as Merbau, Spotted Gum. AUSSIE CLEAR LIGHT is for blond to mid toned timber such as Blackbutt, Silvertop Ash, and Cypress Pine. Apply AUSSIE CLEAR dry surfaces, free from dirt grease and wax. Previously varnished or painted surfaces must be thoroughly stripped. Badly weathered surfaces should be sanded back or cleaned using a wood cleaner such as Preschem’s GREY DECK CLEANER. It can be applied by any convenient means, such as brush, roller, spray or dip application, however floors & decks are most easily applied with a lambswool applicator. Apply one coat of AUSSIE CLEAR, working it into the timber. Any excess oil, remaining on the surface after one hour should be wiped off. If the timber still looks dry, another application may be required. Allow 24 hours for thorough drying. Timber treated with carefully formulated wood finishes such as the AUSSIE CLEAR decking oil will not blacken when maintained regularly. However, over time and depending on the severity of exposure, the rich colour of the timber will fade. Repeat applications are simple as the timber can be re-oiled to bring back the rich natural timber texture. 1, 4, 10 and 20 litre cans and 200 litre drums. Avoid skin contact by wearing protective clothing. Don’t breathe vapour of spray mist. DO NOT induce vomiting. Give a glass of water to drink and transport to hospital.